Jim Chatfield called me from the road this morning to report seeing "flamed" black locusts (Robinia pseudoacacia) along a highway in northeast Ohio. The captivating reddish-brown leaf coloration caused by the native Locust Leafminer Beetle (Odontota dorsalis) is often a familiar sight to travelers motoring on Ohio's interstate highways. Indeed, when beetle populations are high during "outbreak years," black locust trees are able to be identified at highway speeds because of their blow-torched appearance. The damage is caused by both the larvae which feed as leafminers and the adults which feed as skeletonizers. There are two generations per season with the first generation initiated by overwintered adults. The occurrence of two rounds of leaf damage is why the flaming of black locusts becomes more apparent as the season progresses. 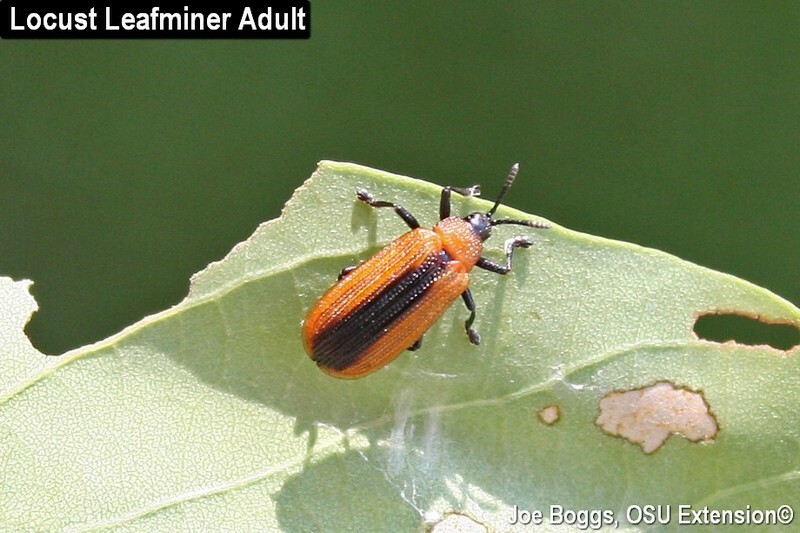 Thus far this season, it appears that heavy infestations are highly localized and not widespread in Ohio. The locust leafminer does not attack honeylocust (Gleditsia triacanthos). However, clusters of orangish-brown leaves and leaflets produced by the non-native Mimosa Webworm (Homadaula anisocentra) on honeylocust may lead to cases of drive-by mistaken identity in terms of tree and pest ID. Even though mimosa webworms produce webbing, as their common name indicates, their webbing is confined to knitting leaves and leaflets together which is not readily apparent at highway speeds!